I ran into Masaru Kubota's circuit snippets and they look pretty interesting. 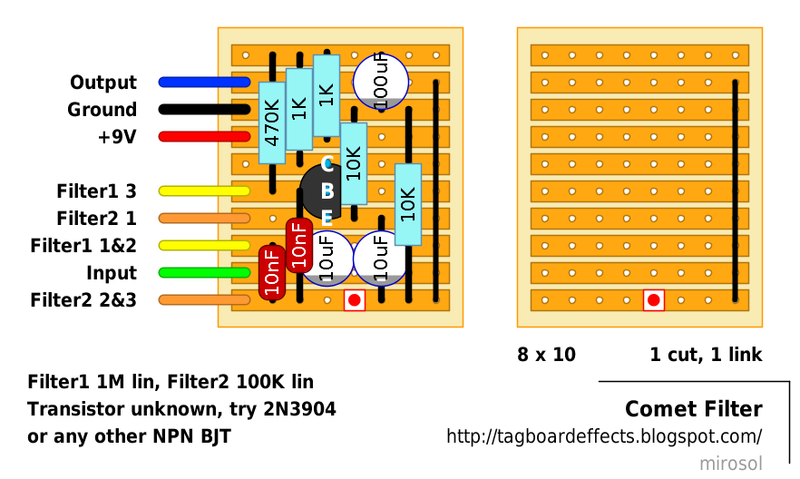 Info about this one: The Comet Filter is a Twin-T notch filter that I modified. That should clear up any confusion... I modified the Twin-T notch filter around 1995 so that I would get a sound that sounded like a phase shifter. If you're in love with this circuit, then I'm flattered. The sound ranges from low-pass filter to scooped metal to hard rock to cardboard. If you use an SPDT, not a DPDT, bypass switch, that disables the output, with the input still connected to the input of this circuit, the circuit still works. You might even say that the circuit works better than when the filter is directly in the signal path. This circuit sounds really good and even better, it can keep you out of the "poorhouse". By the way, the comet that this filter is named after is the Comet Hyakutake. Verified! Not a bad pedal, it gives a bit more control over the EQ than just using the amp controls and the slight phase sounds pretty good, especially when you're twisting the dial. In fact I reckon with a little tweaking you could replace filter 2 with an LDR and use it as a hand/foot controlled phaser. Good idea to use an LDR in this, i think there are a lot of pedals that have potential to have LDR controlled parameters, its something im going to do with the vorg warp sound when i build it. I already have a delay with an LDR in, sounds freaky! Yeah I've seen a couple of pedals on Devi Ever's site that use them, they look like fun! Oh and Mirosol I'll be looking forward to some of those, there might be a hidden gem in there. Ah yes, used in that context they're annoying, but used instead of potentiometers they can be great fun, simply mount them in led bezels on the outside of your fun and waggle your foot for freaky noise heaven! I like to put my LED/LDR`s on a daughter board, saves bothering about layout placement and makes them easier to replace. I have a few different combo`s made up so i can try them out in a circuit to see which give the best results. Me too, have a look at the 'mushroom echo' by moody sounds, its terrific! Let us know how it goes if you try it. Hi Sergio, the way i would do it is too build the circuit exactly as the diagram shows, but then solder one wire from lug 1 of the filter 2 pot and attach it to one leg of the LDR, then from the other leg of the ldr, solder a wire to the center lug of an SPDT switch. Next, from either of the outer lugs of the SPDT, solder a wire to either lug 2 or 3 of the filter 2 pot (shouldnt matter which lug as they should be connected together anyway). This should now mean you have an mode for controlling the filter with the ldr and one for controlling it with the pot. Thanks, Dave! That's a great explanation, I ' ll try it soon, maybe during this weekend, I' ll let you know when it's done, to tell you how it works! Any suggestion for the LDR? No worries, i look forward to hearing that. You'll want an LDR that has a maximum resistance similar to the value of the potentiometer i think, so in this case something that goes from around 100 ohms to 100 k ohms. I am kind of interested in building one of these. Does anyone know if there is a demo of it anywhere? I should be able to record a demo for you but I'm pretty busy with work at the moment so maybe check back at the weekend and I should have it done. I made it but didn't notice any sort of effect changes.... By the way this is my first comment and i LOVE this site!!! Thank you, blessed awesome layout makers! I just built this and seem to be having a huge humming issue. I switched out the trannie from a 3904 to a 2222a and still got the hum. When connecting filter lugs 1 and 2 and filter lugs 2 and three, am I supposed to put two wires in one spot or am I bridging across the lugs? Hey, I just build this, but I think I'm not going to save it. The effect is very little and there's a small volume drop. It' sort of a fixed wah, but with a very very small range of soundeffect. Hey everyone, i've just build this effect for my bass. It works, but if i play a bit harder the sound distorts... What should i do? Change a resistor? If yes, then which and to what value?